So everyone (even homesteaders) needs to dress up nice sometimes. 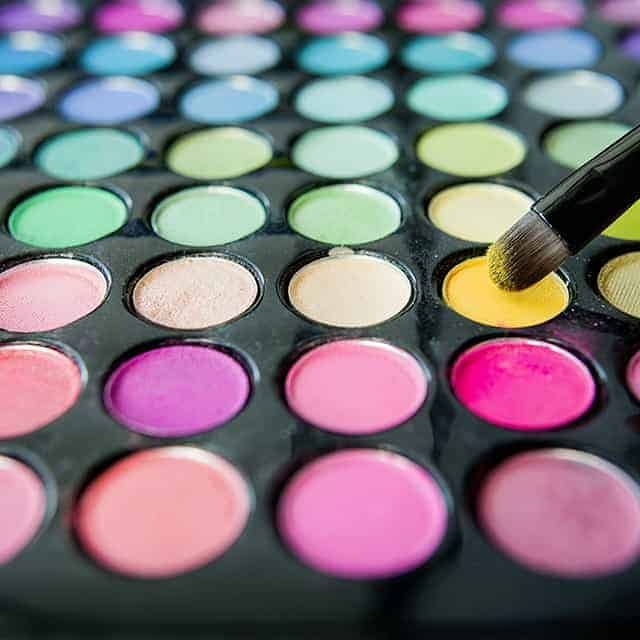 One great option to conventional makeup products is to make your own! Before I get in to some of the products that I use, I do want to recommend that you check out the Environmental Wellness Group (EWG). I love that the EWG provides consumers with the information necessary to make an informed decision about the products that they are using! Alright, so let’s get started! The first product I wanted to talk to you about is my foundation. I also use a face powder. My favorite is this pressed foundation from Honeybee Gardens. Next let’s talk about eyeliner. So I’ll admit that my makeup skills are subpar. It has always been harder for me to find natural mascaras that have good ingredients. Last, but not least let’s move on to eye shadow. And sometimes you might just want to put on a little bit of makeup before going out for the day. I’m not the type of girl that won’t go out without makeup on. In fact there are probably more days I don’t wear makeup than I do! But sometimes it’s nice to get a little bit dressed up and wear a little bit of makeup. I love beauty products, but I don’t love some of the ingredients that are in those products! Have you ever taken the time to look at the ingredients in your makeup products? I can’t even pronounce half of them! I love using natural products, but I’m also not made of money. And natural makeup can get pricey, real fast. So I’ve done my research and I want to share some of my favorite natural makeup products that are reasonably priced. And I think that’s amazing! But, I also don’t have a ton of spare time on my hands, so making my own makeup can be pretty difficult. So today I wanted to go through some of the makeup products that I use all the time that have good ingredients and are all cruelty-free. Most (if not all) of the products I will talk about today are cruelty free which is amazing! I love that most of the companies that produce the products I use are very careful about the impact they have on animals and the environment. They have a website called Skin Deep that rates makeup products based off of their ingredients. This website gives you an overall rating of the product on a scale of 0-10 (0=the best, 10=really bad) and it breaks down the effect that the ingredients can have on the body. You can search a makeup product and read about all of the ingredients in that product. The ingredients are rated based on scientific studies about the effect of that product on the body (including if it causes allergies, cancer, or reproductive issues). It’s an amazing resource and I check all of my products on this website before I buy them, so that I know if that product has good ingredients, and if they test on animals. Another recommendation I have is don’t immediately discount a makeup product just because it’s a drugstore brand. There are actually many drug store products that have good ingredients and don’t test on animals. Before we get started you should know that all of these products are products that I have used and have worked for me. I’m not a dermatologist and I always recommend that you choose any product carefully and make sure you do some research before you start using it on your skin! As a teenager I had acne-prone skin, and so to compensate for that I would cover my face with foundation. I was using a makeup brand that I hadn’t done any research on and I remember being so frustrated that my skin wasn’t getting any better over the years. Fast forward to my early 20’s when I started learning more about ingredients in makeup. I decided to switch to a natural foundation and within a couple of months a lot of my acne had cleared up! Personally, I think that there were ingredients in the old brand that I was using that were causing the acne, and once I switched to a brand with good ingredients my acne cleared up! The brand I use now is Lauren Brooke Cosmetiques. I use their creme foundation and I absolutely love it! It smells amazing and the ingredients are great! I will say this definitely isn’t a full coverage foundation, but it evens out my skin tone and covers minor blemishes. At first I was scared away from this foundation because it was a little out of my price range (over $30 for a small pot seemed like A LOT for a college student) but this stuff lasts forever. It goes a really long way and I typically only have to buy a new one every 8-9 months which is awesome! I’ve also used this tinted moisturizer from Physicians Formula. I really liked it, but it doesn’t have a lot of color options and even the lightest color is too dark for my skin (I’m super pale:) It’s only around $10-12 which is great! Honeybee Gardens is one of my favorite companies to buy makeup from (as you’ll see later in this article, A LOT of the products I use are from them). They have products with good ingredients that are reasonably priced. And all of their products smell like flowers which is AMAZING! For blush I actually use this one from e.l.f. This stuff is cheap! And it has decent ingredients as well and I believe (not 100% sure though) that e.l.f is cruelty free! This product is rated as a 2 on the EWG which is pretty good! Honeybee Gardens also has an amazing blush that has great ingredients and looks awesome! Enjoy the simple things ? Complexion Perfecting Blush with maracuja ? to even out your skin tone creating a beautiful finish with minimal effort. Wouldn’t it be great if everything in life was this simple? ? So I don’t use bronzer anymore (right now I’m just embracing my pale skin) but I have tried a bronzer from Physicians formula. They’re rated either as a 1 or 2 on the EWG and they’re light enough that they look natural on fair skin. I’m not good at doing my makeup. So there’s NO WAY I could use an liquid eyeliner. That would be a disaster. I use this pencil eyeliner from Wet n Wild when I want to look a little bit more dressed up. Plus it’s only a dollar. It’s rated as a 3 on the EWG which isn’t bad for a drug store product. Most of the natural ones I’ve tried aren’t dark enough for me. Honeybee gardens has a good one if you like the natural look for your lashes. That one is quite dark enough for me, so I normally use the Milani Big and Bigger Lashes mascara. The ingredients aren’t as good as I would like (it’s a 4 on the EWG and I normally don’t like to use products above a 2 or 3) but it is cruelty free. I also like the Organic Wear Mascara from Physicians Formula. It’s rated as a 1 on the EWG’s website. So I clearly love Honeybee Gardens just a little bit too much because all of my eyeshadow is from them as well! Although it’s a little bit of an investment up front, this stuff lasts forever, so it’s worth it! What natural makeup products do you use? I would love to hear about them! Share them with me in the comments below!